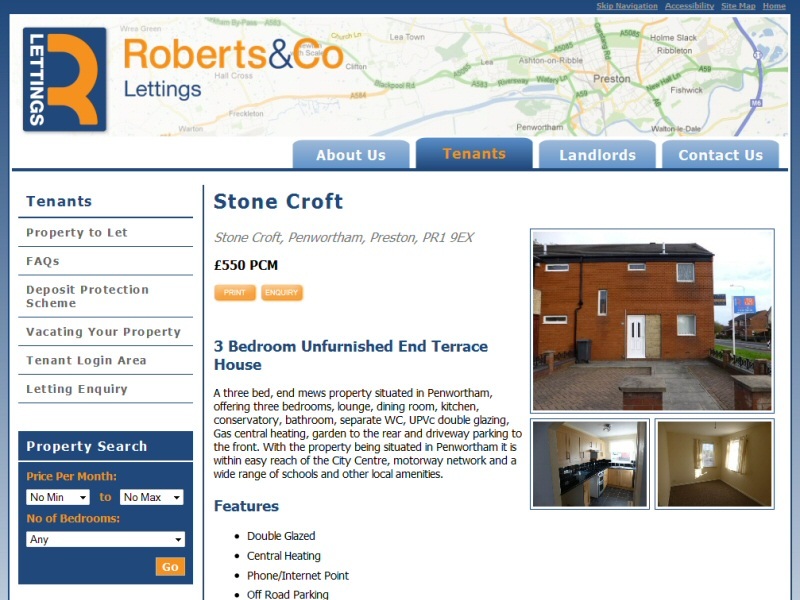 Letting agent website designed for Roberts & Co of Penwortham, PrestonLooking for a website for your letting agent or estate agent business? EasierThan Website Design can design websites to integrate with popular letting and estate agency software such as LetMC and DezRez. We can liaise with the software suppliers on all technical aspects of the website build to ensure it makes best use of available features. This often works out cheaper than getting the supplier themselves to develop a site for you, plus it means that you have somebody local to work with. All of our web design solutions include Domain Name Registration, website hosting and Email Addresses as standard, which are charged for at a favourable rate on an annual basis. If preferred, we can also develop a wholly bespoke solution for yourselves with a back-end Content Management System to supply data to a branded customer facing website. "As a new business starting in an already busy market, we knew that our website would have to be both creative and functional for both existing and potential customers. Dave at EasierThan listened to our long list of requirements and worked with our back office software company to produce a website tailored to our company's individual needs whilst incorporating off-the-shelf features that were integral to our business. We are really pleased with the end result and would happily recommend EasierThan to any other business." Website integrated to third party letting management software to provide real time property listings.